Discover the wonders of ancient Egypt while staying in luxury hotels and travelling in style. This trip includes four nights onboard the SunBoat IV, a magnificent Nile cruiser. There’s no better way to sail down Egypt’s fabled river. You’ll visit the enigmatic Sphinx, the temples of Luxor and The Valley Of The Kings And Queens. At the Step Pyramid of King Zoser, you’ll see the world’s oldest standing stone structure. Over at the Pyramids of Geezer, you’ll see the only surviving relic of the Seven Wonders of the Ancient World. This group trip is a great way to discover the glories of ancient Egypt, a civilisation that lasted roughly from 3100 BC until the death of Cleopatra in 30 BC. The cultural legacy of Egypt and its Pharaohs continues to fascinate, arguably more than any other ancient civilization. For those wanting to venture further, you can join an optional Jordan extension. 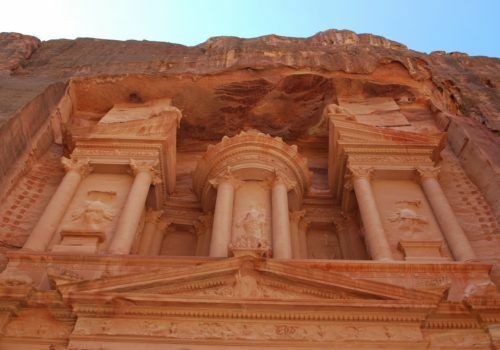 You’ll visit Amman, Madaba, Wadi Rum and the red sand desert landscape of Petra. Our representative will meet you outside customs and transfer you to our hotel. We’ll be staying in luxury accommodation overlooking the pyramids. Our first full day will be action-packed. We’ll be visiting Memphis where the first pyramids were built. The Step Pyramid of King Zoser was the first every pyramid and it’s the world’s oldest standing stone structure – it was built in 27 BC! After lunch at Mena House Hotel, we’ll visit the Great Pyramids of Giza – the only surviving example of the Seven Wonders Of The Ancient World. Nearby, the Sphinx stares enigmatically into the desert. We’ll be flying to Luxor in the morning. When we land, we’ll transfer to the Temple of Karnak in what was once ancient Thebes. We’ll walk through the columns of Great Hypostyle, and then board our Nile Cruiser. After having lunch onboard, we’ll sail in luxury down the Nile. This is one of the finest vessels in Egypt. Today we’ll visit the Acropolis of Thebes on the west bank of the Nile. We’ll visit the tomb of Tutankhamun, explore the Valley of the Queens and the Temple of Hatshepsut. We’ll have lunch and afternoon tea onboard and sail to Esna. Our Egyptologist will take us for a tour of the Greco-Roman temple of Khnum in Esna. The Hypostyle Hall was constructed during the reign of Emperor Claudius, and it’s very well preserved. We’ll then cruise to Edu and have lunch onboard in the lounge. In the afternoon, we’ll explore the Temple of Horus. Tonight, we’ll be throwing an Egyptian party with costumes and a lavish buffet of Egyptian food. We’ll have breakfast and visit the temple of Kom Ombo. It’s located at a bend in the Nile where crocodiles once luxuriated in the sun on the banks of the river. After lunch onboard, we’ll cruise to Aswan where we’ll take a motorboat to Philae Temple. You can then take a ride on an Egyptian sailboat to Elephantine Island. Afternoon tea onboard and then a farewell gala dinner. Waiters with white gloves will be serving gourmet food. We’ll disembark the boat and fly to Abu Simbel. Here we’ll visit the temples of Ramses II, the great Pharo of the New Kingdom. We’ll then fly back to Cairo and check into our 5-star hotel. It has the splendid backdrop of the pyramids on one side and the Nile on the other. Today we’ll visit the Museum of Egyptian Antiquities, home to many of Egypt’s greatest treasures, including Tutankhamun’s treasures and the fascinating Mummy Room. After lunch, we’ll visit the bustling market square of Khan el-Khalili Bazaar. Then, we’ll visit the Mosque and Madrasa of Sultan Hassan, built in 1356, and also the Citadel, built in 1176 to guard Cairo against the Crusaders. We’ll have a farewell dinner at the hotel in the evening. If you’re joining the optional Jordan extension, you’ll fly to Amman and transfer to our hotel. We’ll dine at a local restaurant in the evening. Over three days, we’ll visit many of the best sites in Jordan, including the Roman city of Jerash, one of the best preserved ancient cities. We’ll also go on a panoramic city tour of Amman. 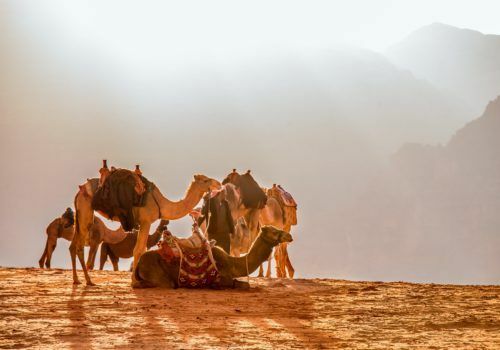 No trip to Jordan is complete without visiting the red sands of Petra. On our way, we’ll stop off at Mt Nebo where Moses (allegedly!) saw the Holy Land. Petra is a UNESCO Heritage site. Once a merchant city, its enigmatic red sands form the backdrop of many famous movies. As Petra looks like the surface of Mars, many Sci-Fi movies have been shot here. At night, part of the rock city is lit by candlelight, creating a stunning atmosphere.